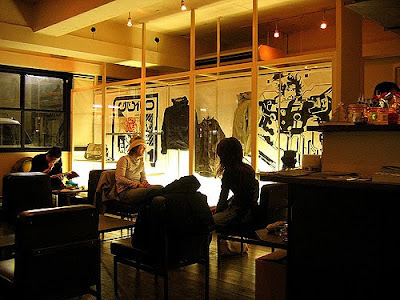 Cafe Pause is a stylish, superb cafe-bar located in Ikebukuro, Tokyo. 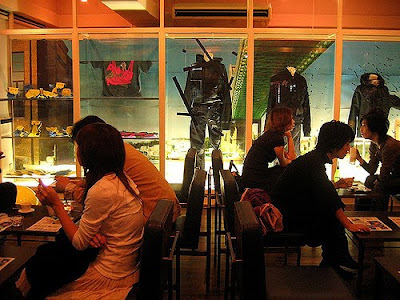 Ikebukuro is a multiple city center situated in the northwestern corner of the Yamanote Loop Line. The center offers plenty of entertainment, shopping and dinning oppurtunities. 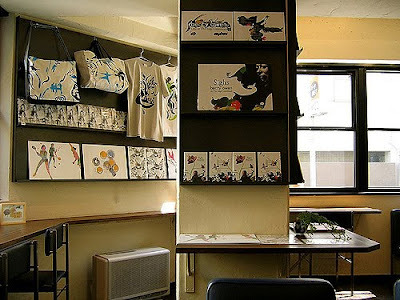 The wonderful design cafe also acting as the office and showcase for designer toys company Roughtoys, and a bit of gallery, as seen with the Shu-Thang Grafix images that adorned the walls. Cafe Pause features wireless internet and small collection of books, also produces events and parties. 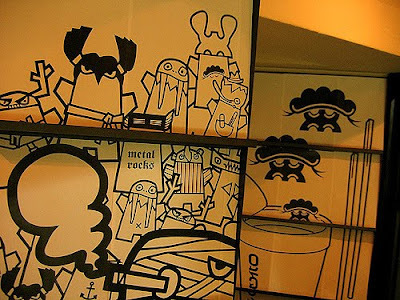 The interior design of the cafe is a mixture of interesting chairs, lounges, sofas, tables and wall amazing features.